UK Community Supported Agriculture. Photo by Steve Patton. 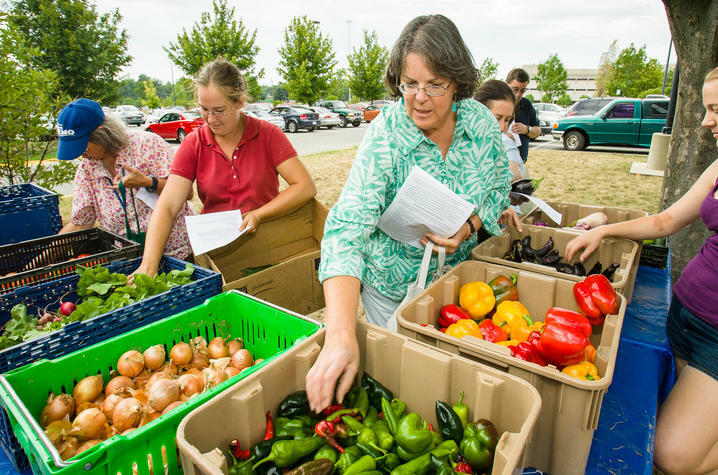 LEXINGTON, Ky. (Jan. 31, 2019) — Registration is now open for the 2019 season of the University of Kentucky’s Community Supported Agriculture Project. All UK faculty, staff and students are eligible to enroll in the program, which provides members with fresh vegetables from May 23 through Oct. 17 from the U.S. Department of Agriculture-certified organic unit of the UK Horticulture Research Farm in Lexington. The number of shares is limited and offered on a first-come, first-served basis. When registering, participants can choose to pick up their weekly shares on Thursdays either from 4 to 6 p.m. EDT in the orange parking lot of the E.S. Good Barn on campus or from 3:30 to 6:30 p.m. at the UK Horticulture Research Farm, located at 4321 Emmert Farm Lane. For more information on the CSA program email uk.csa@uky.edu or go online to https://sustainableag.ca.uky.edu/csa. To register online, go to www3.ca.uky.edu/sustainable-ag/csa/new.php. Registrants can pay with credit card or check. Make check payable to UK CSA and mail to: CSA Manager, N318 Ag Sciences Bldg., Lexington, KY 40546.